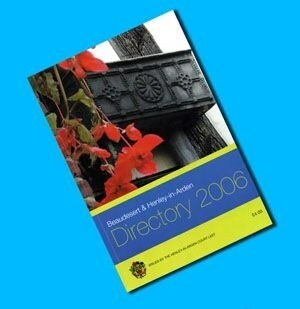 The Beaudesert and Henley Directory 2006 has been published by the Court Leet. 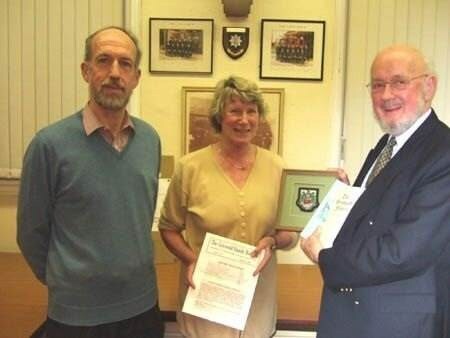 Douglas Bridgewater, the new High Bailiff, has succeeded with his first major project in delivering an excellent edition, bigger and more informative than in previous years. Our picture shows Douglas Bridgewater, High Bailiff with Ray Holding, Low Bailiff, receiving the first consignment from the printers. The High Bailiff will be writing in Henley NEWS on-line about this project in a future edition. Since last week's edition, Henley NEWS on-line has received a letter from the Joint Parish Council about its new website. In this letter, the Clerk to the Council states that the JPC "is currently developing its own website about the council and its policies" and continues, "The Council hopes you might reconsider your position with a view to continuing". This letter implies that the council has decided to curtail any ambitions to develop a super Henley website. However, the JPC's development website, screen shot above taken on Wednesday 25th January, contains links to Information Pages which claim to provide Everything there is to know about Henley and another link to their Latest Newsletter - What's happening in Henley-in-Arden.. Clearly, the change in policy has not yet been communicated to the website developers. There are many examples of duplication. 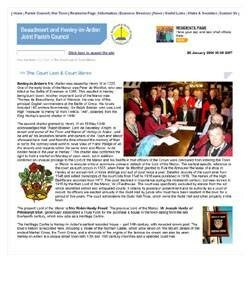 The JPC Court Leet page is almost identical to Henley NEWS on-line's, even down to the use of italics. However, we will not be organising a Spot the Difference Competition! There is another interesting and unexplained mystery on the terms page. 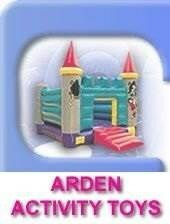 Ownership of the site is not in the name of the JPC but Henley-in-Arden.co.uk. 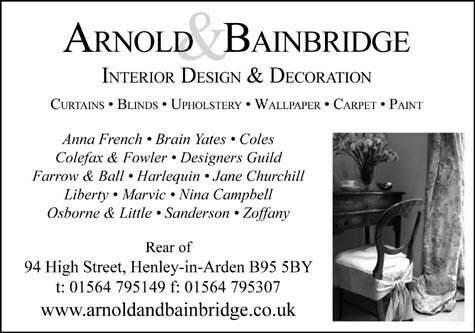 Who is Henley-in-Arden.co.uk? There is no company registered at Companies House of that name. Is a commercial operation being re-launched? This would explain the use in the website address of .co.uk rather than .org.uk which would be appropriate for a not-for-profit organisation like the JPC. Nominet, the register of domain names, reveals some further information. Is it not time the JPC told the residents of Henley, what is going on? Surely, there can be no excuses! Henley NEWS on-line is publishing the Henley Community Websites Initiative which it has been proposing for many months. We are also organising an electronic poll to test support for this proposition. If the results show a clear majority in support, we will suggest to the JPC that they should reconsider their strategy and sign up to the Henley Community Websites Initiative. If this happens, we will continue publishing weekly editions of Henley NEWS on-line. We would like to thank the large number of the readers, who have written offering their support and encouragement. However, in the interests of balance, we must also report that we have received one letter with the opposite point of view. "At present you are the owner and the editor. In my opinion you cannot do both jobs. You should relinquish the editorial ship and find someone who is more suited and more objective for this task." "I think you have been doing a superb job these last two years reporting the news of Henley without it being 'vetted' by the Parish Council. I have just read Nigel's letter and wholeheartedly agree with every word. What's more, I would be quite willing to pay a subscription to receive your newsletter if that would help to keep it independent." "It is with great disappointment that I read about the forthcoming demise of Henley News On-line. I have always enjoyed reading it, finding it the quickest, easiest and most entertaining way of finding out what is going on in Henley . Thanks for being an independent voice." "In common with many of your regular readers I was extremely sorry to learn of your imminent demise. 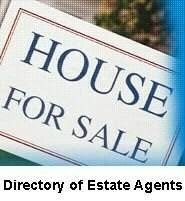 I would like to thank all involved for providing an absolutely first class service over the years." "Please reconsider - I love your website - its very interesting and informative and I will be very upset if you shut it down!" This is a small selection of the letters which we have received this week. In addition, we have received many verbal expressions of support and have also seen the largest increase in readers subscribing to our automatic email notification service, including two from the USA. The website readership stats show that visits to the Henley NEWS on-line website have soared in recent days. 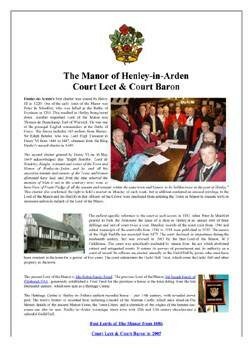 Henley NEWS on-line is published by Warwickshire Enterprises Ltd. and this publication is a not-for-profit initiative. 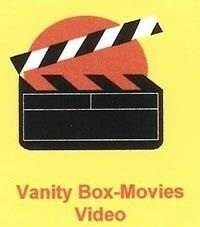 It costs over £500 per year to produce and the editor is not a director of the company. Access to the new JPC site is now password protected presumably as a result of press comment earlier today. Henley NEWS on-line has taken screen shots of many of the pages as we expected this to happen. It has become apparent that there are already a number of Henley websites providing very similar information about Henley and it is a probable that in the future further websites will be launched. This uncoordinated approach is clearly undesirable for the image of Henley, providing a poor impression of the town to people considering moving their homes or their businesses to Henley. It could become as bad as the multiplicity of free papers which are delivered each week through our front doors. In the end, people just ignore them. Henley NEWS on-line has been proposing for many months that a committee under the auspices of one of the respected impartial town organisations, such as the TIC, should oversee an integrated approach for both present and future Henley websites. 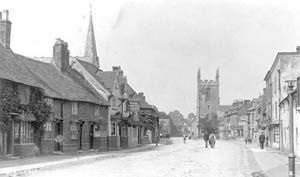 As part of this initiative, we believe that there should be a site called "This is Henley-in-Arden" at www. henley-in-arden.org.uk and this should become the gateway site for Henley-in-Arden. It would consist probably of only two pages. The front page would be a general introduction to Henley with an message from the High Bailiff and would link to the major sites, as shown in the diagram below. The second page would contain a directory of all the Henley websites, which had signed up to the initiative. This gateway site should be owned by the Community Websites Committee, which would be responsible for setting standards, preventing overlaps between sites and acting as the arbitrator in the event of conflicts. The committee would encourage hyperlinks between sites to improve Google and other search engine scores. It would promote all the Henley Websites to the residents and seek a grant from the JPC for these promotion costs. In return for this grant, the committee would offer to run the JPC's website (www.henleyjpc.org.uk) free of charge, with ownership and editorial control of the JPC's site remaining with the JPC. This would save the JPC the expense of employing an outside commercial organisation to manage its site and so would be at nil additional cost to the JPC budget. Does this initiative have the support of the town? Electronic Poll - Please vote now! I SUPPORT the Henley Community Website Initiative. I DO NOT SUPPORT the Henley Community Website Initiative. Multiple voting will be disallowed. New Stealth Tax point at Edstone! The authorities appear to be installing a permanent Gatso Speed Enforcement Camera on the road to Stratford (A3400) just before the entrance to Edstone Hall. Warning motorists that they are approaching one of the most dangerous bends in the area, might have been a much more effective way of reducing accidents. 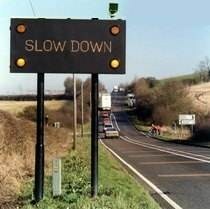 Most experienced drivers would have welcomed a sign similar to the one illustrated below but of course it would not have yielded any revenue. Furthermore, it would probably have cost less money to install. Civic Society - Greswolds Everywhere….. So it seemed during David Patterson’s most enjoyable presentation to Henley & Beaudesert Civic Society’s January meeting. The title of the talk was ‘Greswold or Griswold’, indicating alternative spellings of a local family name. Mr Patterson advised that there are a further 33 recognised spellings, but whatever the spelling, the name has persisted. When male children have been lacking, inheritance has sometimes depended upon the recipient changing his name to Greswold/Griswold ! Variants of the name are associated with many places in the area between Birmingham, Stratford and Stoneleigh. Greswolds lived in Henley and Tanworth, but exactly where is not known. If anyone has information, please let Mr Patterson know. First known references to the name are found in Snitterfield in the 1200s and a nearby cottage bears the name Griswold Farm. Gris thought to mean gravel and wold meaning a hill may be the origin of the name, since a gravelly hill exists near the cottage. The family became wealthy and during the 13th and 15th centuries made endowments to the chantry chapel of St Alpheges church in Solihull, one endowment being the extant roof timbers of the main church. In 1560, some of the endowment was used to found what is now Solihull School. By the late 1700s Henry Greswold-Lewis lived at Malvern Hall and was thought to be the wealthiest commoner in England. A painting of Elizabeth, one of Henry’s sisters, was copied by the then young John Constable who also painted a landscape view of Malvern Hall in 1809. The copy portrait and a Constable original landscape were sold at Sothebys a few years ago for £20,000 and £9 million respectively. By the 1890’s Francis Greswold-Williams had spent the family fortune and Malvern Hall was sold and became a school. During the Civil War, some Greswolds were royalists and others parliamentarians. There was an instance in 1603 when Robert Griswold was accosted whilst accompanying a Jesuit priest in the lanes near Baddesley Clinton. His 2nd cousin, George, was with the magistrate and offered to forget they’d seen him. However, Robert would not forsake his priest. The outcome was the hanging drawing and quartering of the priest and the hanging of Robert, who became one of the English Martyrs. In 1995 a new church in Balsall Common was named the Church of the Blessed Robert Griswold, in his honour. In the 1630s four Griswolds emigrated to America and settled around Boston and the mouth of the River Connecticut. Their descendents still live in these areas and have a club www.griswoldfamily.org . 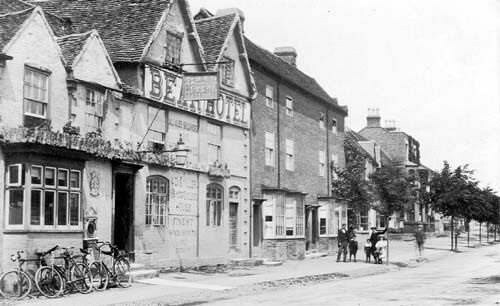 Places and buildings there bear the name in its various forms, including a pub known locally as the Gris. Club members have visited Solihull and its surroundings, from time to time, to learn about their forbears. Years ago, I purchased an exquisite drawing by Bill Yardley. 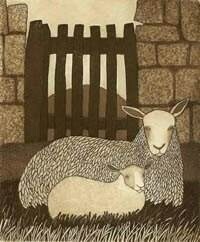 In the foreground are 2 sheep; the background features a Norman church and a night sky. Anyone who has walked in the countryside at night time will know how this artist has captured the mystery and activity, which abounds in the dark; while we humans sleep, the animal world is very alive. My next purchase was a miniature featuring an owl on a stonewall. Very often I wondered about this very talented artist and whether he was still executing his pictures. Imagine my delight when Torquil Potteries in the High Street featured Bill Yardley’s pictures. One was a sketch of a sheep, the other was in colour – my collection had doubled! Reg and Maggie Moon of Torquil Pottery introduced me to Bill Yardley and his wife, who were a down to earth farming couple. We chatted about farming and Bill farms in Warwickshire. He related to me the morning he went to check his sheep to find the gate open. The poor animals were huddled fearfully together in the corner of the field. 2,000 tyres had been dumped in the field, which meant he had to pay the bill for the removal. Eventually, the Police traced the illegal dumper. When I enjoy Bill Yardley’s pictures, I wonder why our farmers are not more appreciated. Can we really afford to diminish our farming base, which cannot go aboard like our manufacturing base? Have Jeremy Paxman and Sheila Hancock’s riveting family history stories on the BBC series, ‘Who Do You Think You Are?’ wetted your appetite for family history? Do you find your births, baptisms and censuses all a bit confusing? Want to know where to start? Staff at Warwickshire County Record Office are on hand to help out. Come along to their Family History for Beginners session on Monday 6 February at 2.30pm. Booking is essential for this popular course so why not give them a ring on 01926 738959 to reserve your place? A charge of £2 per person applies. If you can’t make that, why not log onto Warwickshire County Record Office’s web site to learn more about how to trace your ancestors? Go to www.warwickshire.gov.uk/countyrecordoffice and find out more. No appointment is necessary to use the record office, but do bring along ID to obtain a readers’ ticket. Local residents are being urged to sign up to a new scheme to help beat burglars. In a bid to make our streets a safer place, Warwickshire Police are offering the people of Hatton Park estate in Warwick the chance to join up to their SmartWater Scheme, and Warwickshire County Council are holding an open meeting for householders to come along and find out more. 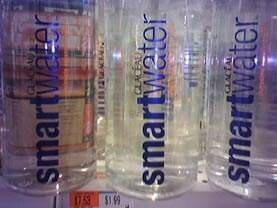 SmartWater is used to mark property with out leaving a trace visible to the naked eye. It is a revolutionary product that has helped cut burglaries by 74% in the West Midlands and is used by 95% of the UK’s Police force. The ‘water’ has forensic properties that are similar to DNA and can irrefutably link property to its owner and criminals to the crime scene. It has been so successful that residents are five times less likely to become a burglary victim if SmartWater is used to mark property and protect business premises. If one in five properties start using the product, the Police will provide the estate with lamppost signs to warn burglars that SmartWater is in use. The meeting is at 8.00pm on Monday 23 January at Hatton Park Village Hall. PC Gary Knight from Warwick Police Station will be on hand to offer residents advice and people will be able to see a demonstration of SmartWater property marking during the evening. The SmartWater has been heavily subsidised by the Police and kits will be available at the meeting to purchase for £12.00, normally costing £25. SHOCK and dismay was voiced this week at a decision by the Royal Shakespeare Company that’s claimed will deprive Stratford of at least £4 million a year in tourist spending. The RSC announced to a stunned meeting of the Stratford Community Forum last Thursday evening that it will be closing the 450-seat Swan Theatre throughout most of the two-year-plus redevelopment of its main house. Originally it was envisaged that the Swan would close “for a short time” during the refurbishment of the main house. But an RSC spokeswoman said that because the two theatres were “so linked together” it was expected that the Swan would have to close for two summer seasons—2008 and 2009. Work on the main house is due to start some time after April 2007 and be completed ready for re-opening in early 2010. Meanwhile, the 1,000-seat temporary “Courtyard Theatre”—now being erected at the back of The Other Place in Southern Lane—will operate from July this year until the RST refurbishment is finished. Staff at Warwick Hospital are having their wages docked for using the car park. The new charges came into force this month and now mean lower paid workers pay £5 a month and senior employees are expected to pay £10. Up until now it has been free despite public car parking charges rising. A member of staff, who asked not to be named, said: "It seems really unfair - the poor students even have to pay for it." She has chosen to park elsewhere because of the extra costs but said it was an inconvenience. A concerned resident added: "The decision to penalise the very people who provide the caring for the sick and save lives, is beyond me. It is exploitation of the worst kind as medical staff have no way of fighting back." He said there are surgeons, doctors and nurses who have to travel between hospitals and make home visits and need their car. Royal College of Nursing regional director Ann Leedhan-Smith said: "This is a running problem with hospitals because in a larger sense you should not make someone pay to come to work. People who work unsociable hours have to have a car and they are reliant on them." She said there should be concessions for staff who work late at night and do not have the option of getting public transport. But a South Warwickshire General Hospitals Trust spokesman said: "It is the trust's aim to encourage 'green travel' and to support the reduction in the number of cars entering the site.
" This brings us in line with other neighbouring trusts in this regard and will allow further financial resources to go toward patient care." Members of staff who have agreed to travel together have been offered free parking to encourage car sharing. The spokesman added: "Some minor concerns have been raised, but the majority of these have been successfully resolved and the initiative is currently running smoothly.
" A substantial number of staff who live locally are now actively supporting the green transport policy by walking or cycling to work." She said staff have been asked to be sensitive to neighbours and not to cause inconvenience by parking on nearby streets. Sometime before 11:40 hours on Sunday 8th January unknown offender/s have removed the boards of a boarded up premises on the Stratford Road, Henley and gained entry. Offender/s have caused damage within the property and left a number of empty Vodka bottles inside. Between 01:00 hours and 09:00 hours on Friday 13th January unknown offender/s have gained entry to a barn building on Danzey Green, Tanworth by cutting the locks securing the doors. Once inside offender/s have cut a chain securing a Quadzilla Quad motor bike. Offender/s have made off with the same in an unknown direction. Sometime between Thursday 23rd December and Sunday 1st January unknown offender/s have stolen the front registration plates from a Honda Civic motor vehicle parked secure and unattended in Henley. Between 13:00 hours and 22:00 hours on Friday 13th January unknown offender/s have smashed the rear window of a Land Rover Defender Motor vehicle parked secure and unattended on a public house car park in Ullenhall. No property from within the vehicle has been stolen. Sometime before 01:53 hours on Thursday 19th January unknown offender/s have gained entry to a BMW 320 motor vehicle parked secure and unattended on Pigeon Green, Snitterfield by smashing the window. Offender/s have stolen a coat from within. Sometime before 22:55 hours on Tuesday 10th January unknown offender/s have smashed the window of a motor vehicle parked secure and unattended on Castle road, Henley. Offender/s have stolen a satellite navigation system from within. Between 17:30 hours and 21:55 hours on Tuesday 10th January unknown offender/s have smashed the window of a motor vehicle parked secure and unattended in Henley. Offender/s have stolen a satellite navigation system from within. At approximately 20:07 hours on Tuesday 10th January unknown offender/s have smashed the window of a Vauxhall Astra estate motor vehicle parked secure and unattended in Chingley Bank, Henley. Once inside offender/s have stolen the satellite navigation system from within. Poultry keepers with 50 or more birds are being urged to register their flocks now by Warwickshire County Council Trading Standard’s Animal Health Team. 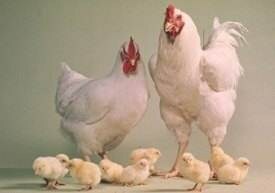 Poultry keepers have until 28th February to register their flocks with DEFRA, if they have 50 or more birds. The information will then be placed upon the national poultry register. Premises with fewer than 50 birds are not required to register. However, they can voluntarily register their birds after 28 February if they wish to. The Avian Influenza (Preventative Measures) Regulations 2005, require poultry keepers of 50 or more birds kept on commercial premises to keep a register. For the purpose of the Great Britain Register "poultry " means all birds which are reared, given, sold, or kept in captivity for commercial purposes including: showing; breeding; the production of meat or eggs for consumption; the production of other commercial products; and restocking supplies of game. This requirement does not apply to premises where all poultry (and their eggs) are kept by their owners for their own consumption, or as pets. downloading a form from the DEFRA website www.DEFRA.gov.uk and returning it. The register is supported by the National Farmers' Union, the British Poultry Council and the National Gamekeepers Organisation. Auditions are open to everyone.